This month I had the good fortune to attend a friends 50th birthday celebration. It involved people flying in from various parts of the world for a three day camping event. We were camping in a very remote and very beautiful part of Australia in a place called Arnhem Land. This area is culturally and spiritually a very special place and is also one of the last true wildernesses in the world - a place where you can still experience an authentic natural environment. We were a large party that was represented by many different cultures and languages and for the most part were individuals who had not met before. For three days we lived in a very remote part of Australia where the only way out was a three-hour drive to the nearest town. By throwing together and isolating a group of people from so many different cultures and backgrounds and forcing them to co-exist for three days, my friend who hosted the party had inadvertently created a cultural laboratory! Being keenly tuned to group dynamics and cultural awareness, this camping trip provided me endless opportunities to observe the mechanics of human interaction and the impact and effect that culture had on these interactions. One group of campers were headed out on a fishing trip and decided that it would be a good idea to take some cold beers with them. They went to the fridge (yes - this was luxury camping - we had a fridge!) and removed all the cold beer. No-one in this group thought to restock the fridge. Soon after the fishing group departed another group arrived back at camp, tired and dusty from a grueling four-wheel drive expedition. The four-wheel drivers headed to the fridge in anticipation of sitting down to a relaxing, icy-cold beer. Of course the fridge was bare, all of the beers had been taken, and all that was on offer was unrefrigerated, tepid beer. The driving group was disappointed and frustrated that they had no cold beer and that no-one had thought to replenish the fridge. I should point out that the fishing group were not Australians. I knew that they had no idea of the 'unspoken rule' of camping in Australia - and that is if you take cold beer from a fridge you replace it, so that there is cold beer for the next person. After watching the reaction of people realising there was no cold beer, I was concerned that they may have concluded the fishing group to be selfish and thoughtless of their fellow campers. I considered the negative impact that these thoughts could have on the weekend. I decided to speak up. When the fishing group returned I quietly explained the 'unspoken beer rules' in Australia, so that they would have this awareness for the future, and would have an opportunity to redress the situation. The outcome was a group of people who were completely unaware of the impact that their behaviours had and were keen to use the situation as an opportunity to explain their ignorance surrounding the cultural code of beer to their fellow campers. When we see a cultural "faux pas" occurring we need to be a bridge and speak up with sensitivity. Sometimes people are unaware they have 'broken the rules' because they didn't know the rules in the first place! Try to have coaches or relationships with people in your network that you can trust who will speak up when they see situations occurring. Consider situations from different perspectives, through another lens. Have some personal awareness of how your behaviour impacts others. Observe the behaviours of others around you. Clearly a lack of awareness was at the root of this situation which led to behaviours that were offensive to one group but natural to another. Mindfulness helps us to be aware and present in the moment and therefore allows us to be more responsive when situations arise. ALWAYS replace the beer you take out of the fridge! One of the many appeals that this book had for me was the way in which Jaworski skilfully shares his life with the reader by weaving some of his most meaningful, painful and exiting moments in a way that encourages the reader to reflect on their own experiences and levels of connectedness with the world. Jaworski was a successful corporate lawyer who chose to leave the law firm in search of an authentic life following the collapse of his marriage. On his journey to authenticity he realised that his life was full of choices and that there was a level of interconnectedness between him and the world, and that he actually had a lot of control over creating his own circumstances. One of the messages that he sends is that it is our attitudes and levels of openness that shape our worlds. We create our own lives and opportunities, but in order for us to see this we need to slow down, 'live in the moment' and observe what is happening around us. This is one of the behaviours that I often speak to clients about when they are trying to increase their cultural intelligence. Jaworski created the American Leadership Forum, which focuses specifically on developing leadership in American communities, businesses and administration. 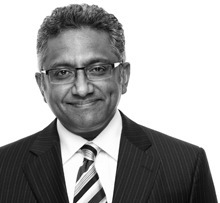 Leadership, he argues, is about collectively listening to what is wanting to emerge in the world, and then having the courage to do what is needed. 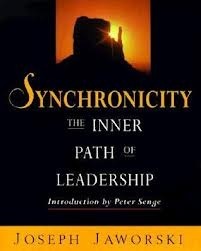 "Synchronicity:The Inner Path of Leadership" by Joseph Jaworski (2011).